This past 4 months of Summer has been pretty hard going in the land of KK, and I know I've been quiet on the ol' blog front - but as the clouds begin to clear, and the future is not so much the pit of despair it has been recently, I'm raising my head over the parapet, as it were. Partly because I wanted to share a transitional Autumnal number with you - but also, I've missed you all! 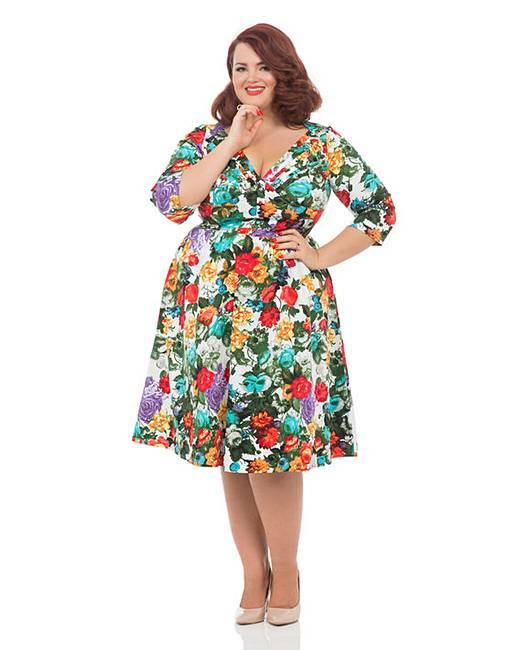 This Hell Bunny beaut, modeled by the stunning Georgina Horne of of Fuller Figure Fuller Bust, with it's thick material, longer sleeves and yet summery print, makes this dress a lush Autumn piece - to be worn with tights, or bare legged, depending on the weather! I find the Hell Bunny sizing a little off most of the time, so opted for the 4X - my go to size in this type of brand. I suspect, because the dress is a little on the big side, the neckline likes to slip and show my bra - which is the same no matter which bra I wear it with. (I personally recommend this bra with this dress, as it gives great shape and lift! I wear a 36JJ, for reference). To counter the revealing neckline moments, I've taken to pulling the shoulders wider, so it's a bit more of a bandeau neckline, which a bit of plunge too! I wore it recently to take my Grandma out to Sunday lunch, and the looser fit meant I was able to lift her walker in and out of the car with ease - not something people do every day, but certainly a winner with me! I wore it bare legged with plimsolls, but would happily pair it with black tights and Chelsea boots and denim jacket for most of Autumn / Winter, I'm sure! It's no longer available in a 3x or 4x, but there are plenty of awesome dresses on here - including some lush Hell Bunny numbers! A short but sweet blog post from me, which is hopefully a sign of more to come! 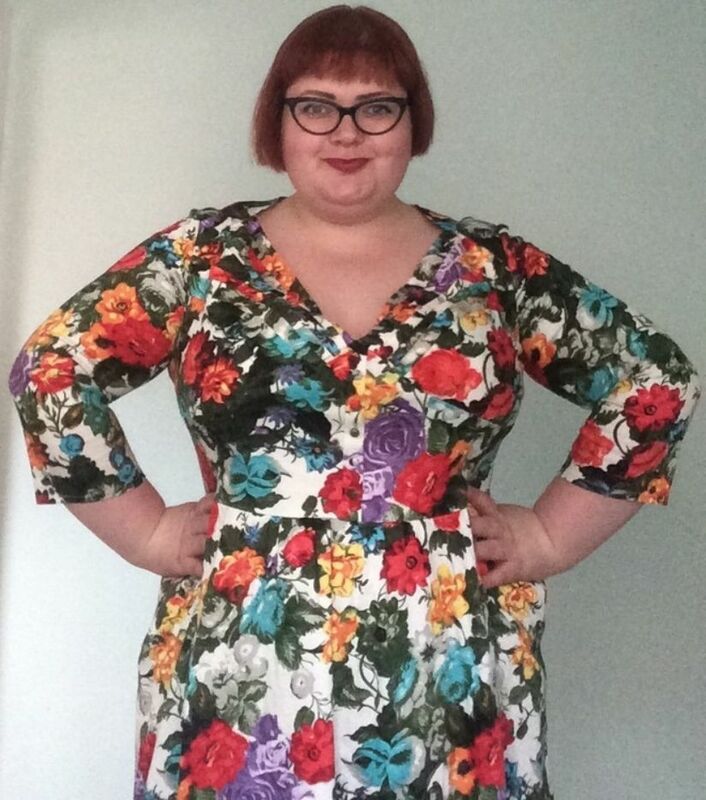 KK you look amazing - the print is so beautifully vibrant print. 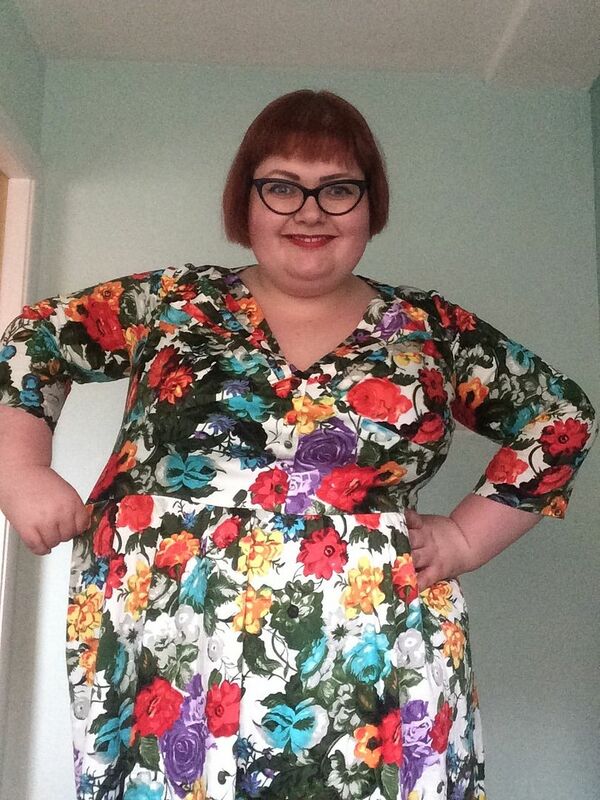 Just shove a belt on for the gaping waist - I do that will all my fitted dresses!